41 90517 - Cord Inlet Cover (bl 9443). 60 90438 - Suction Hose Cover (bk). 37 90482 - Inqicador Filter. 38 90483 - Outlet Filter. 52 90490 - Curved Handle Sk. 7 90095 - Scr Tpg Pan 4 X 16. 23 90163 - Scr Tpg Pan 4 X 20. 42 90486 - Screw Tpg Pan 3 X 20. 45 90096 - Pan Hd, Tapping Screw 3 X 8. 47 90436 - Hose Nook Cover (bk). 49 90437 - Wand Hose Joint (bk). 54 90442 - Suction Hose (sk). 27 90475 - Carbon Brush Assy. 15 90510 - Case Ornament (bl 8.443). 1 90505 - Dust Box (bl 8-443). 2 90506 - Dust Box Inscription (bl 8-443). 4 90507 - Clamp Hook (bl 8-443). 6 90120 - Air Inlet Fitting. 11 FIX90461 - Duster Arm. 12 90508 - Switch Ornament Ibt 84431. 17 90511 - Cord Assy (bk) L= 280. 18 90512 - Brake Roller Assy (key No -20-23). 19 90468 - Brake Arm Bracket. 20 90469 - Brake Spring. 21 90513 - Repl By 51778. Please email For Price. 24 90514 - Case Upper (bl B-443). 34 90479 - Cord Reel Comp, (incur Cord). 35 90480 - Power Cord (u2). 36 90516 - Case Lower (bl 9.443). 43 90518 - Name Plate. 55 90491 - Floor Tool Complete (bk). 56 90492 - Floor Tool Case (bk). 59 90495 - Bend (bk). 60 90496 - Slide Arm (bk). 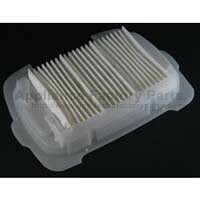 62 90498 - Brush Base Assembly. 69 90519 - Tool Caddy (bl 8-4431). 61 20-90497 - Floor Base. 66 90450 - Connection Wand (bk).